The taxon Berruornis was established by Mourer-Chauvire (1994) for fossils from the late Paleocene of the Mont Berru area in France. The species from this locality, Berruornis orbisantiqui Mourer-Chauvire, 1994, is known from several tarsometa-tarsi and an incomplete distal tibiotarsus. A second species of Berruornis, B. halbedeli Mayr, 2007, occurs in the late Paleocene of Walbeck in Germany and is represented by a tarsometatarsus and a tentatively referred partial upper beak (Mayr 2002f, 2007a). 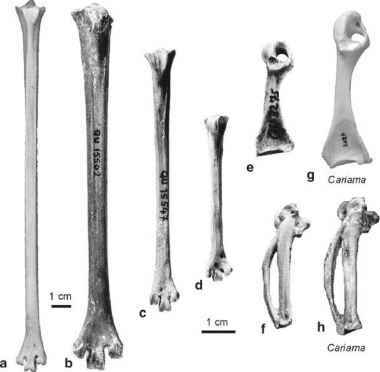 According to Mourer-Chauvire (1994) a large phalanx of a strigiform-like bird, which was reported by Nessov (1992) from the late Paleocene of Kazakhstan, may also belong to Berruornis. The species of Berruornis were very large, about the size of the extant Snowy Owl, Nyctea scandiaca. Their assignment to the Strigiformes can be established with the absence of a supratendinal bridge on the distal tibiotarsus, the morphology of the hypotarsus, which exhibits two widely separated crests, and the large tarsometatarsal trochlea for the second toe (Mourer-Chauvire 1994). The tarsomet-atarsus is very stout and the medial crest of the hypotarsus is pierced by a small foramen. The plantarly directing wing-like flange of the tarsometatarsal trochlea for the fourth toe is much less developed than in extant owls. If assignment of the Walbeck beak to Berruornis is correct, the taxon also had a more elongated and mediolaterally much narrower beak than crown group Strigiformes. The ventral surface of the rostral end of the premaxillary symphysis is further distinctive in that it bears two grooves along its sides, which among extant birds occur in the Falconidae and, albeit much less pronounced, in the Cathartidae. Berruornis was assigned to the Sophiornithidae by Mourer-Chauvire (1994). This latter taxon was originally erected for Sophiornis quercynus Mourer-Chauvire, 1987, a likewise very large, Bubo-sized species, which is known from a tarsometa-tarsus, a distal humerus, and pedal phalanges from an unknown locality and horizon of the Quercy fissure fillings. Classification of Berruornis into the Sophiornithidae is, however, largely based on overall similarity, and as detailed by Mourer-Chauvire (1994), Berruornis and Sophiornis distinctly differ in several features. Most notably, and in contrast those in Sophiornis, the tarsometatarsal trochleae for the second and fourth toes are only weakly plantarly deflected in Berruornis, which may indicate a sister group relationship to all other strigiform birds. Compared with the tarsometatarsus of other owls from the Quercy fissure fillings, the tarsometatarsus of Berruornis more closely resembles that of Palaeobyas, which is equally stout, with only weakly deflected trochleae (Sect. 15.4).